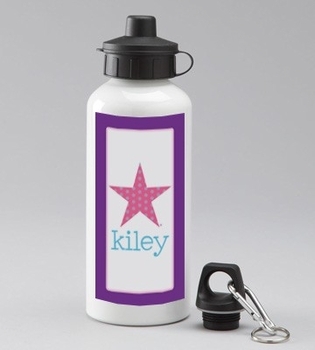 Let your child shine like a star with her Star h2o bottle carrying her name. This well-designed bottle comes with an exclusive option of personalization as per your requirements. You can select your font and name to be imprinted on this bottle. It is non toxic and BPA free. This bottle is made of aluminum and can hold up to 600 ml of liquid. This wonderful creation makes a great gift items for your loved ones. Custom made to order for each customer and ships directly from the designer.